Order your four bottle� Filtrete Water Station at FiltersFast.com! Google Analytics is a funny thing sometimes. If you’re unfamiliar, Google Analytics allows blog owners to see the search terms that bring surfers to their blog. Upon searching through some of these keywords this morning, I noticed that many of you are looking for a “4 Bottle Water Filter.” Others were looking for the four bottle water filter, four bottle water purifier, Filtrete water bottle system, 4 bottle water filter system, 4 bottle water purifier, filter water four bottle, filter with four water bottles, filtered water bottle filler, four water bottle filler — I could go on and on. Whatever you call it, you guys are all searching for the new 3M Filtrete Water Station, which allows you to filter and fill four water bottles in just seconds. Just fill the Filtrete Water Station with water from your sink, and the� Fast Flow Filter reduces sediment and the taste and odor of chlorine from your water. 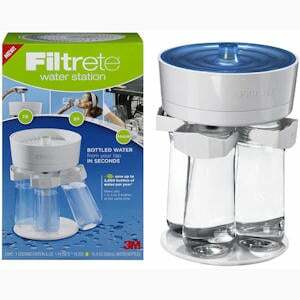 We just added the 3M Filtrete Water Station to the site, and we’re really excited about it. Up to 40 percent of bottled water is nothing more than filtered tap water, so why pay an arm and a leg for it? With the Filtrete Water Station, you can bottle your own water at home and take it with you wherever you go. Save yourself cash and save the environment from the many water bottles that go unrecycled every year. If you’ve got a family that loves drinking water and would like a few extra bottles to have on standby, you can purchase replacement water bottles for the Filtrete Water Station. These reusable water bottles hold 16.9 ounces of water and are BPA free water bottles. They are also dishwasher safe. Unlike many water filters, the Filtrete Water Station filter is recyclable.